Kicking carbs to the curb? These new wraps are a delightfully cheesy way to enjoy your favorite sandwiches. Lovers of low-carb meals have been wrapping tacos and burritos in lettuce for years. But now, there's a new way to roll up your favorite meats and veggies — and it's a pretty cheesy solution. Costco is selling tortilla-size sheets of cheese, and they're called Folios Cheese Wraps. The wraps, which are currently being stocked at stores in the Northwest, are made entirely out of cheese and come in cheddar, Jarlsberg Swiss and Parmesan flavors. The wraps are lightly baked, which allows the cheese to keep its shape. According to Folios, not only can cheese lovers and low-carb dieters use the malleable slice as they would a regular flour tortilla or whole-wheat wrap, they can also be cooked in the microwave to create chips, cheese-shaped bowls (that's one way to make your own version of Chipotle's Keto Salad Bowl at home) or crisped cheese bits that can be sprinkled on soups and salads. Each wrap has approximately 170 calories, 12 grams of fat, 290 milligrams of sodium, 1 gram of carbs, 12 grams of protein and no sugar. They also don't contain fiber (you win that round, lettuce wraps! ), but are free of gluten and lactose, which is good for consumers with certain food allergies. Since these wraps are mostly fat and protein, and practically carb free, registered dietician Bonnie Taub-Dix, creator of BetterThanDieting.com and author of "Read It Before You Eat It: Taking You from Label to Table," told TODAY Food that they're also ketogenic diet-approved. However, she does not recommend stuffing them with other high-sodium, high-fat contents such as deli meat, which may not be very healthy. With 12 grams of fat, 8 of which are saturated, Taub-Dix is wary about people swapping out regular whole-grain wraps for just cheese on a regular basis. For those looking to consume these wraps for their protein value, Taub-Dix said the best way to do so (without overdoing it on the sodium and animal fat) is to stuff them with fresh veggies. Plus, avoiding carbs altogether isn't usually recommended. "Healthy types of tortilla wraps can provide whole grains and fiber, both missing from these wraps. The majority of us don’t get enough whole grains or fiber, but we get plenty of fat and protein," Taub-Dix told TODAY Food. Many nutritionists advise clients to adhere to a well-balanced diet filled with a variety of foods, including fresh produce, whole grains and lean proteins. 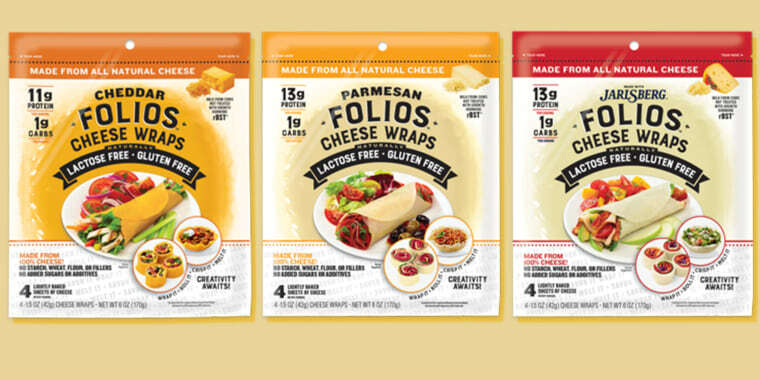 Folios Cheese Wraps come in packs of four (which retail for about $5.99) or 10 sheets for $9.99, and will soon be available at grocery stores like Aldi, H-E-B, Jewel and Hy-Vee.